In 2015, NagaCorp appointed Political & Economic Risk Consultancy, Ltd. (PERC), an independent third party from the Company, to conduct a research and review on investment risks in Cambodia. Established in 1976, PERC is headquartered in Hong Kong and engaged principally in the monitoring and auditing of country risks in Asia. From this base, PERC manages a team of researchers and analysts in the ASEAN countries, the Greater China region and South Korea. Corporations and financial institutions worldwide use PERC's services to assess key trends and critical issues shaping the region, to identify growth opportunities, and to develop effective strategies for capitalizing on these opportunities. 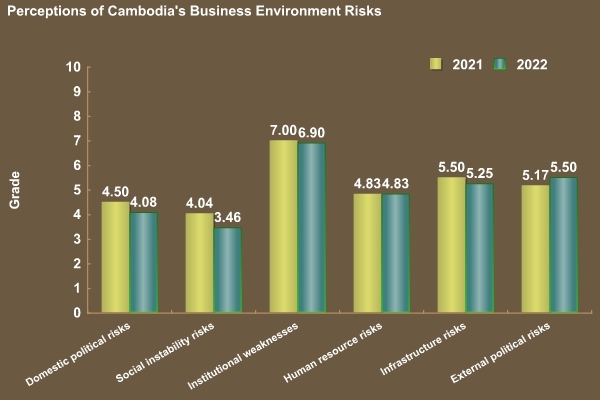 In the research, political, social, investment and macro-economic risks in Cambodia were assessed and reviewed, particularly as they relate to NagaCorp's casino, hotel and entertainment business operations. In arriving at its findings below, PERC took into account, among others, domestic political risks, social instability risks, institutional weaknesses, human resource risks, infrastructure risks and external political risks. Grades range from zero to 10, with zero being the best grade possible and 10 the worst. Each of these variables is itself made up of a number of sub-variables relating to specific aspects of the category being assessed. The weighted sum of the grades for sub-variables equals the score of a broader variable, while the weighted sum of the grades of the broad variables defines overall investment risks in Cambodia. We have treated each variable as having equal importance or weight. The maximum possible risk rating is 10 (the worst grade possible) while the minimum is 0 (the most favorable grade possible). PERC's most recent risk survey gives Cambodia an overall risk grade of 5.88 (slightly worse than one year ago). 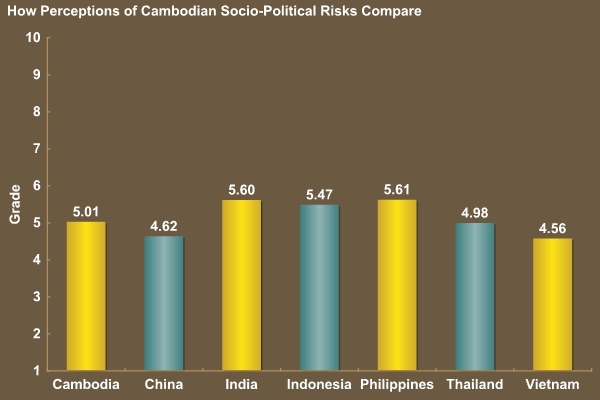 Cambodia's political and social risks are moderate and fairly stable. There has been a small deterioration in political risks during the past year due mainly to the failure of the political opposition to inspire confidence in its ability to form and run a government if it were to win the 2018 national elections. Weaknesses in the process of policy formulation by the government are another negative factor. On the other hand, there is greater confidence now than there was a year ago that the present government will win the next elections. It is replacing some old guard leaders with younger, better educated leaders who are pushing economic, education and social reforms that should help the government win back some of the voter support it lost in the last elections. The biggest problems the country faces are due in large part to the country's continuing strong economic performance. This rapid growth, which is being sustained even at a time when the rest of the Southeast Asian region is experiencing a significant slowdown in growth, is placing new demands on the country's physical and human infrastructure. These demands are growing faster than the government is building new infrastructure, creating strains that could eventually hurt the country's relative competitiveness. When it comes to physical infrastructure, the high cost of electricity is perhaps the largest single problem, while the main negative issue with labor is the shortage of trained staff capable of independent thinking and implementing modern processes. The major industries driving growth are changing. Construction has emerged as the leading growth sector, but the downside here is that a real estate bubble could occur. Agriculture has weakened and is not living up to its potential. The industrial sector is diversifying, with new foreign investments in electronic component s and other sub-assembly industries, but garments and footwear still dominate the manufacturing sector. Tourism continues to lead the growth of service industries, but other services like finance and retail trade are also growing in importance. No matter what happens politically, whoever holds political power in Cambodia will have to keep nurturing the growth of all these industries in order to maintain popular support. There is little risk that policies will change that discourage tourism or the role of foreign investment. Cambodia's single strongest external relationship is with Mainland China, but the government is also having success in maintaining its relations with other countries like the US, Japan and EU members. This is ensuring that the Cambodian government gets the external support it needs to finance important programs, maintain a stable balance of payments, and protect currency stability. These relationships are also contributing to strong foreign direct investment inflows and exports at a time when many other countries in the region are being adversely affected by weak external demand conditions. One of the most encouraging developments of the past year was the way tourism inflows from Mainland China continued to grow strongly despite the slowdown in China's economy and government policies that caused a sharp fall in Mainland visitors to places like Macao. The strong visitor inflows from China reflect both the continuing attractions to Mainland Chinese of Cambodia as a destination and the continuing emphasis Beijing is placing on cultivating a strong relationship with Cambodia. Solid growth and improved tax and customs administration have eased fiscal pressures on the government. The growth of domestic revenues sources has been complemented by continuing strong growth in external bilateral assistance, especially from China. Cambodia's close relations with China dovetail with the ongoing transformation in China's trade patterns and regional factory relocation. This gives Cambodia a unique opportunity to diversify its production and export base. The government has been taking steps to improve transparency and predictability of customs procedures in order to expedite cross-border flows of goods and integration with regional supply chain networks. Streamlining bureaucratic procedures is also improving the environment for foreign investors. Appreciation of the real effective exchange rate following US dollar strengthening and growing competition from other low-cost producers are all challenges. Concerns regarding governance, access to finance, institutional efficiency, education and skills, and inadequate infrastructure also need to be addressed better. Recent trends suggest that average real wages are growing faster than in other countries and are outpacing gains in productivity. Moreover, the reputation of the labor force is being hurt by its militancy. Because of serious deficiencies in the local education system, it will be up to private sector employers to provide training so they have the staff needed to support rapidly growing businesses in the face of growing competition. Service industries like tourism are especially vulnerable since their clients, especially Mainland Chinese and Vietnamese, are becoming more sophisticated in their travel expectations. This means it is not adequate just to maintain service standards. Those standards need to keep improving. In addition to rising labor costs, companies will also have to deal with continuing high-energy costs and weak physical infrastructure, especially a poorly maintained road system that impedes movement of people and goods both within the country and across its borders. Bank credit has been growing so rapidly (30% p.a. plus) for so long that the quality of banks' loan portfolios is vulnerable to such factors as a correction in real estate prices and a continuation of low agricultural prices.